Seeing a significant storm surge is pretty rare in San Diego, but the combination of several days of strong winds and the lowest barometric pressure ever recorded in San Diego (987.1 mb/29.15 inHg) produced a storm surge of a little over a foot in height. 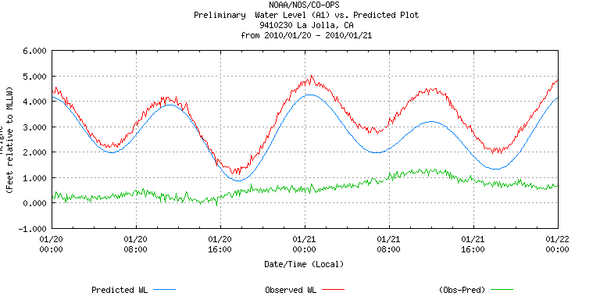 The image shows the predicted and observed water levels at Scripps pier, with the surge peaking at about noon yesterday. (Click on the image for larger size). 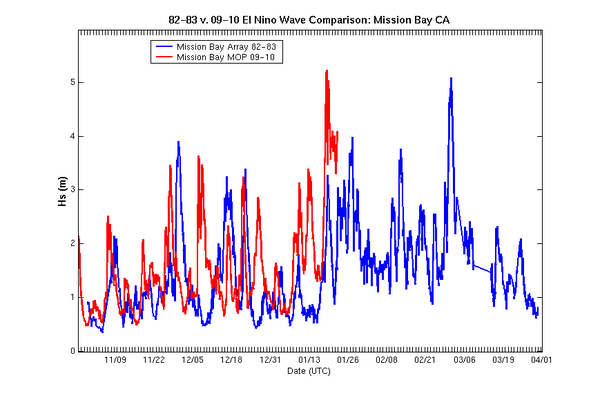 Below is a comparison of significant wave heights for the two elnino seasons 1982-1983 and 2009-2010. (Click on the image for larger size).